Page 12. Math tutoring: Animated Angle to Geometry Problems and Theorems. Level: High School, SAT Prep, GRE, GMAT, College geometry. Cabri, GSP, Cinderella. 31. 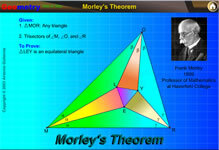 Morley's Theorem. See more. 34. Newton's Theorem: Newton's Line. 39. Platonic Solids. Interactive animation.